Marlain Angelides and Brian Childers in My Wife in a Chador. Photo by Jonathan Slaff. BOTTOM LINE: This provocative yet overly ambitious production looks at the likelihood of electing a New York City mayor with familial ties to the Muslim community. Playwright Claudio Angelini, a well-respected TV news anchor and writer in his native Italy, seems to want to help Americans discern the many political strands that comprise the growing Muslim population in the United States. Yes, there are some wannabe terrorists, he notes in his latest effort, My Wife in a Chador, but there are also outspoken feminists and moderates who want nothing more than to champion the ideals of freedom, democracy, and human rights. Unfortunately, this less-than-startling observation is really all the play has to offer. The story -- which unfolds on a beautifully designed stage divided into a living space for married couple John Mayer (Brian Childers) and his British-born wife, Rosa (Marlain Angelides); a bar where Mayer goes to drown his sorrows; the apartment of an underwear designer named Eva (Kristin Taylor); and an office where Mayer writes the books he hopes will one day win a Pulitzer prize -- is preposterous. To wit: Jim Morgan (Toby Blackwell), a political hack of an undefined sort, approaches Mayer with a bizarre proposition, that he run for mayor, campaigning as a non-politician who will set the city straight. As Mayer -- yes, he would be Mayor Mayer if elected -- ponders the pros and cons of this career move, Rosa is mugged and her purse is snatched. Her immediate response is to turn to Islam, her Yemeni mother’s religion, but as an activist who hopes to change the anti-woman mindset of conservative Imams and fundamentalists of the faith. In short order, she decides to change her name to Abeera and begins covering her hair and neck. This, she says, will help her feel safe. It’s a mind-boggling choice since, by all accounts, women in hijab/chador report being harassed far more often than those without. In addition to asking if presumably liberal New Yorkers are ready to elect a white Christian male married to a practicing Muslim the play touches upon a host of other important issues including: marital fidelity; the inane role of the press in electoral politics; the marketing of candidates for public office; the spectacle of Cage Fighting; the wining, dining, and backside-kissing practiced by those intent on winning literary competitions; and when and how we compromise within relationships. They’re potent themes, but since the play teeters toward farce without becoming truly zany, they lack both sting and in-depth exploration. Furthermore, the characters evoke little emotion in the audience, failing to move beyond caricature to truly engage us. It’s too bad, since how Americans treat the Muslim strangers in our midst -- especially when said strangers refuse to blend in and assimilate -- offers ample fodder for debate and dramatic sparring. Similarly, the play’s many additional themes could and should have been better honed. That said, the play is well-directed, scenes move quickly, and the acting is consistently good. Whether this is enough, however, will be up to the observer. 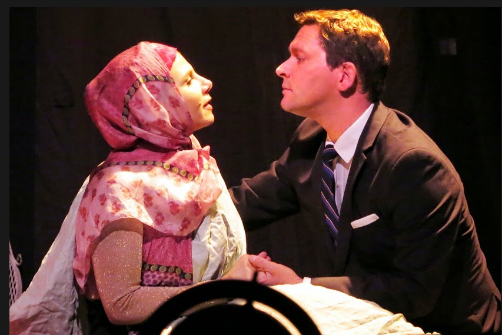 The program for My Wife in a Chador indicates that Angelini believes that “the threat to Westerners from Islamic fundamentalism can be defeated by love.” With John and Abeera as prototypes, he suggests that political and cultural differences can be transcended. I’m not so sure, but I certainly hope he’s right. As beheadings, suicide bombings, and brutal assaults capture headlines day after dismal day, the idea that love can conquer all is certainly appealing, however unlikely.